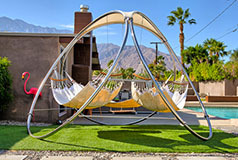 Welcome to Oasis Rentals in beautiful Palm Springs, California. We offer quality modern vacation rental homes, condos, and villas for seasonal or long-term rentals in the desert. Check our selection of ultra-modern homes as well as luxury estates and golf villas. All our vacation rental homes are carefully maintained to ensure the most enjoyable stay for your vacation in Palm Springs. All houses have top-of-the-line amenities to accommodate your needs. Make one of our vacation rentals your home away from home. Please contact us by phone or email anytime and we guarantee a prompt response and a genuine effort to find you the most suitable property for your vacation in Palm Springs.